She was not allowed near anyone’s television, she was not allowed to hold a remote. The last time she tried she was unattended, she was 3, and her parents were questioned for negligence and abuse for leaving their child alone in a burning room. When she touched the voice recording machine and it sparked and exploded, the parents’ explanation was believed and they were sent home with their electric baby. At the doctor, he shook his head. It had heated uncontrollably in his hands. In elementary school, when everyone else was learning computers, she sketched with a wooden pencil (no metal banded eraser) while she walked on the asphalt. She was very good at drawing and very pleased with the fact that her birds looked like birds. When everyone else listened to music, she was playing music on her violin and her piano and her guitar with the nylon strings. She desperately wanted distortion when she got older and angrier, and she enlisted a tech wizard to buzz and distort her guitars after the fact. When he gave her the CD, she had to wear gloves and she couldn’t play it, she just hung it up in her room. It was incredibly difficult not to use watches or clocks or cell phones or cars or music players or blenders or irons. She was a wrinkly, late, unreachable, quiet person who never had smoothies. People thought she was weird and quirky until they asked her to prove her strange disability to them and the air would crackle with electricity as she would ruin a hapless third grader’s handheld video game. When she fell in love at sixteen, she wrote love letters to the boy who understood, and he wrote more beautiful letters back. He took her to movie theaters and stopped wearing his watch and didn’t bring his cell phone. He loved skateboarding with her and bike riding, which was risky but not so risky that she didn’t do it anyway. Some days were worse than others. She would wake up and she wouldn’t take a shower because the metal in the shower would shock her body with sharp pangs of static when she touched it, gluing her fingers to the bar and flexing her triceps involuntarily. Doctor after doctor couldn’t find anything wrong with her. On the bad days, she wasn’t allowed into doctor’s offices. Sometimes she erased video stores just by walking in front of them, especially when she was angry. Anger wasn’t good for her condition, so she was calm and played music when she was angry or kissed her boyfriend and held his hand, or she would take long walks into the sage brush and hope that she wouldn’t be bitten by ticks. Sometimes she would think about zapping people that walked by her, like she had a special power that could actually be used. Someone would duck in front of her in line for the water fountain. Zap! Someone would be mean to her boyfriend. Zap! Someone would get a better grade than her on a final. Zap zap! Her parents didn’t know what to do with her, as a software programmer and a graphic designer, they hoped to share with her all the things that their digital world held, but she was kept at arm’s length. One time, they tried using a mouse that would track the movements of her right pointer finger, but she tried to double click and on the second tap of the air, it was as though a bolt of lightning had shot into the monitor screen and exploded every little bit inside. So they didn’t pay as much attention to her as she became older and more self-sufficient, and she started to resent them for it, and so she eventually tried to leave the city that they were so fond of and she hated. She wanted the country side, where nothing ran on electricity and she could touch whatever she wanted without worry that she would break it. “I’m going to go to the countryside,” She told her boyfriend while they held hands and walked the city streets. “I’ll come with you,” he said. “Can you come without a computer? Can you come without a phone? How would you eat without a microwave?” He wouldn’t be able to eat without a microwave, and he thought about how his parents would want him to call sometimes and then he wouldn’t be able to. “Why can’t I bring those things?” he asked. “You are dangerous.” He tried to be flirty. He tried to nuzzle her nose. She touched one when she gestured to it and the stereo would never work again. “Or a phone…” She touched a payphone and all the quarters that people used started flowing out of it and the boy who loved her briefly wanted to chase after the small mound of change but thought better of it. She hadn’t thought of that. No one had ever thought it was something inside her that could go away. She kissed him for his thoughtfulness and then shook her head. She crackled with electricity and assuredness and shone brilliantly in the night. Posted on Wednesday July 7th, 2010 Wednesday March 26th, 2014 by Max Elman. 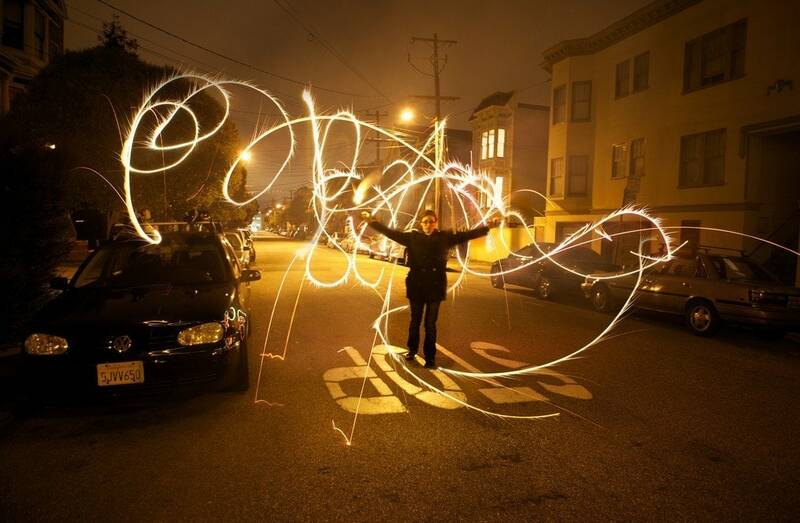 This entry was posted in Photos & Stories and tagged car, fireworks, kristan, lights, night, street. Bookmark the permalink. this. i still think about this.